Linear Alkylbenzene Sulfonate (LAS) Market size was more than USD 5 billion in 2015 and is likely to observe gains more than 5% CAGR over the forecast timespan. Global linear alkylbenzene sulfonate (LAS) market size is positively influenced by increasing product demand in household detergents. The overall household detergents demand in 2015 was roughly around 30 million tons and is projected to exceed 50 million tons over the projected timespan. The product is an anionic surfactant and is majorly used in detergents. It offers characteristics such as reducing the surface tension of water, which helps in removing stains from fabrics and textiles caused by oily & fatty soil. Upgrading consumer lifestyle dynamics accompanied with increasing disposable income has stimulated the demand for detergents in the recent years. This is turn will proliferate the global linear alkylbenzene sulfonate market share over the projected timeframe. Dish washing liquids demand is substantially elevated in the past few years and is likely to expand at a promising growth rate by 2024, particularly due to high demand from food & beverage industry and residential application. Surfactants, thickening and stabilizing agents are widely used in dish washing liquids. Thus, linear alkylbenzene sulfonate market size will be significantly propelled by increasing demand for dish liquids demand across the globe. Furthermore, the product is also used in personal care products such as shampoo, shower gels and hair conditioners due to its emulsifying, foaming and cleansing properties. In addition, the cosmetic industry is likely to observe growth close to 4% over the forecast timespan on account of increasing consumer spending pattern along with awareness towards personal wellbeing will positively boost the overall linear alkylbenzene sulfonate market share in the coming years. LAB (linear alkyl benzene), is the precursor of linear alkylbenzene sulfonate (LAS). Major raw materials used in manufacturing the product are kerosene and benzene. In addition, kerosene, a petrochemical derivative, is the key raw materials used in producing LAB. Which signifies, that the overall linear alkylbenzene sulfonate market price trends follow similar dynamics with petrochemical price. Therefore, wavering crude oil prices is likely to hamper the global business growth by 2024. Nevertheless, the industry will be positively influenced by increasing R&D investment by major product manufacturers for new product development. For instance, Clariant and Stepan Company had opened new R&D center in 2013 and 2014 respectively. 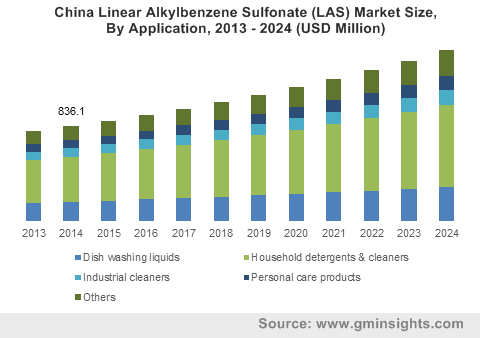 Linear alkylbenzene sulfonate market share for household detergents & cleaners led the overall industry and accounted for more than 40% of the global business share in 2015. In addition, this application is likely to exhibit fastest growth over the forecast timeframe. Increasing awareness along with changing preference of consumer groups across the globe has significantly propelled the household detergents & cleaners demand over the past few years. The product gains focus in household detergents & cleaner application as a surfactant owing to its superior characteristics even at low concentrations. The overall linear alkylbenzene sulfonate market size for personal care products was roughly around USD 450 million in 2015. Escalating personal care product demand across the globe, particularly due to improving consumer lifestyles will positively boost the overall business share in the near future. Superior emulsifying, cleansing and foaming properties of the product makes it suitable to find applications in the personal care product. Asia Pacific led the overall linear alkylbenzene sulfonate market share and accounted for over 40% of the overall volume in 2015. Improving consumer lifestyle dynamics, spending pattern and growing population has significantly propelled the demand for personal care products and household detergents in the region. Furthermore, rapid industrialization in the region along with regulatory norms for maintaining hygiene in the industries has stimulated the industrial cleaners. This is turn will boost the overall business size by 2024. North America linear alkylbenzene sulfonate market size in 2015 was more than USD 850 million. Prevalence of massive customer base of personal care products, dish washing liquid and cleaners is analyzed to be the major factor driving the regional industry growth. Europe linear alkylbenzene sulfonate market size is likely to observe gains close to 5% CAGR over the projected timespan. The regional growth rate is majorly influenced by robust dish washing cleaners and household detergents & cleaners demand. Additionally, prevalence of robust personal care product manufacturing and consumption in France, the UK and Germany will boost linear alkylbenzene sulfonate demand by 2024. The global linear alkylbenzene sulfonate market share is moderately consolidated due to presence of major large-scale product manufacturers. In addition, major industry share contributors captured roughly around half of the overall industry volume in 2015. Some of the industry share contributor includes BASF SE, Clariant Corporation, Hansa Group AG, Croda International, Rhodia SA, Huntsman Corporation, Stepan Company, Henkel AG & Co. KGaA, Galaxy Surfactants Ltd., Evonik Industries AG, DuPont and The Dow Chemical Company. Major industry share contributors including BASF SE, Huntsman Corporation and The Dow Chemical Company have presence across multiple stages of the industry ecosystem, and thus hold a prominent chunk of the overall business. Additionally, other prominent product manufacturers including Clariant and Stepan Company are involved in R&D investments for new product development in order to achieve competitive advantage. Linear alkylbenzene sulfonate (LAS) is anionic surfactant broadly used in detergents and cleaners. LAS is the most preferred surfactant among detergent and personal care product manufacturers due to its comparatively low price and less toxicity. Increasing LAS demand for detergents & cleaners and personal care industries is expected to drive the global linear alkylbenzene sulfonate market size by 2024. Improved consumer lifestyle dynamics, spending pattern and growing pattern are the key industry growth contributors. The product is petrochemical derivative and thus follows similar price dynamics, this may hamper the business growth in the near future. Household detergents & cleaner led the overall demand in 2015. Regionally, Asia Pacific accounted for maximum chunk in the same year.